Dim objects called brown dwarfs, less massive than the sun but more massive than Jupiter, have powerful winds and clouds–specifically, hot patchy clouds made of iron droplets and silicate dust. Scientists recently realized these giant clouds can move and thicken or thin surprisingly rapidly, in less than an Earth day, but did not understand why. Now, researchers have a new model for explaining how clouds move and change shape in brown dwarfs, using insights from NASA's Spitzer Space Telescope. Giant waves cause large-scale movement of particles in brown dwarfs' atmospheres, changing the thickness of the silicate clouds, researchers report in the journal Science. The study also suggests these clouds are organized in bands confined to different latitudes, traveling with different speeds in different bands. "This is the first time we have seen atmospheric bands and waves in brown dwarfs," said lead author Daniel Apai, associate professor of astronomy and planetary sciences at the University of Arizona in Tucson. Just as in Earth's ocean, different types of waves can form in planetary atmospheres. For example, in Earth's atmosphere, very long waves mix cold air from the polar regions to mid-latitudes, which often lead clouds to form or dissipate. The distribution and motions of the clouds on brown dwarfs in this study are more similar to those seen on Jupiter, Saturn, Uranus and Neptune. Neptune has cloud structures that follow banded paths too, but its clouds are made of ice. Observations of Neptune from NASA's Kepler spacecraft, operating in its K2 mission, were important in this comparison between the planet and brown dwarfs. "The atmospheric winds of brown dwarfs seem to be more like Jupiter's familiar regular pattern of belts and zones than the chaotic atmospheric boiling seen on the sun and many other stars," said study co-author Mark Marley at NASA's Ames Research Center in California's Silicon Valley. rown dwarfs can be thought of as failed stars because they are too small to fuse chemical elements in their cores. They can also be thought of as "super planets" because they are more massive than Jupiter, yet have roughly the same diameter. Like gas giant planets, brown dwarfs are mostly made of hydrogen and helium, but they are often found apart from any planetary systems. 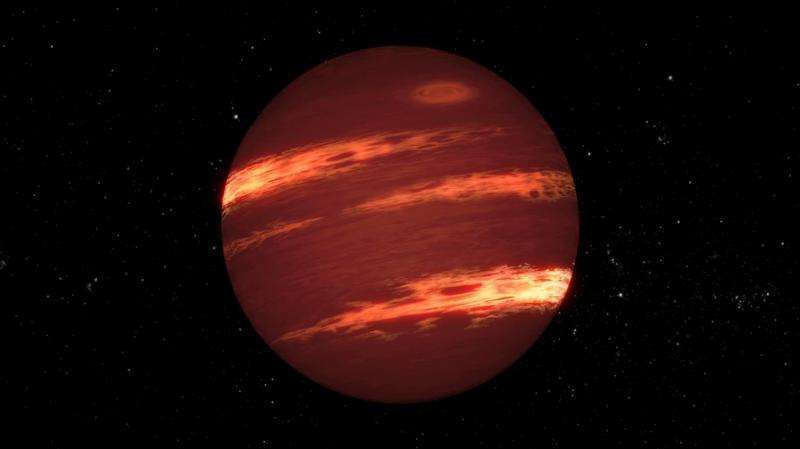 In a 2014 study using Spitzer, scientists found that brown dwarfs commonly have atmospheric storms. Due to their similarity to giant exoplanets, brown dwarfs are windows into planetary systems beyond our own. It is easier to study brown dwarfs than planets because they often do not have a bright host star that obscures them. "It is likely the banded structure and large atmospheric waves we found in brown dwarfs will also be common in giant exoplanets," Apai said. Using Spitzer, scientists monitored brightness changes in six brown dwarfs over more than a year, observing each of them rotate 32 times. As a brown dwarf rotates, its clouds move in and out of the hemisphere seen by the telescope, causing changes in the brightness of the brown dwarf. Scientists then analyzed these brightness variations to explore how silicate clouds are distributed in the brown dwarfs. Researchers had been expecting these brown dwarfs to have elliptical storms resembling Jupiter's Great Red Spot, caused by high-pressure zones. 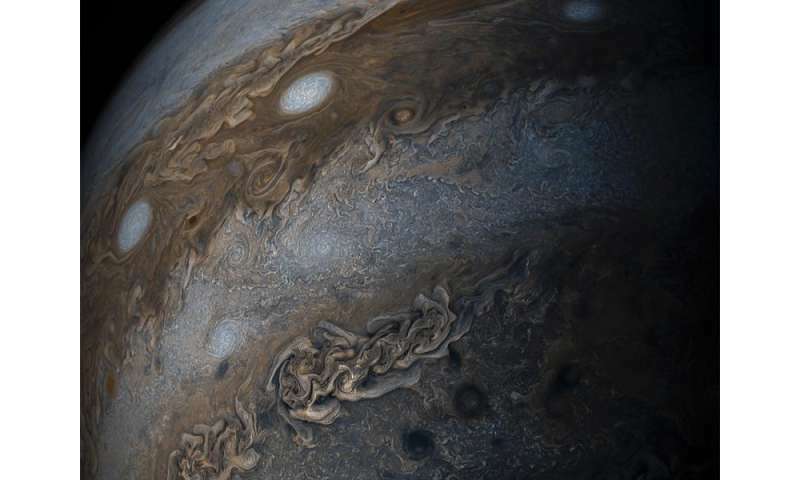 The Great Red Spot has been present in Jupiter for hundreds of years and changes very slowly: Such "spots" could not explain the rapid changes in brightness that scientists saw while observing these brown dwarfs. The brightness levels of the brown dwarfs varied markedly just over the course of an Earth day. To make sense of the ups and downs of brightness, scientists had to rethink their assumptions about what was going on in the brown dwarf atmospheres. The best model to explain the variations involves large waves, propagating through the atmosphere with different periods. These waves would make the cloud structures rotate with different speeds in different bands. University of Arizona researcher Theodora Karalidi used a supercomputer and a new computer algorithm to create maps of how clouds travel on these brown dwarfs. "When the peaks of the two waves are offset, over the course of the day there are two points of maximum brightness," Karalidi said. "When the waves are in sync, you get one large peak, making the brown dwarf twice as bright as with a single wave." The results explain the puzzling behavior and brightness changes that researchers previously saw. The next step is to try to better understand what causes the waves that drive cloud behavior.